Aluminum Tubular carriers feature an ergonomic, lightweight design with multiple adjustments to enhance comfort. Aircraft grade alloys combined with patented technology result in a powerful carrier, allowing elaborate maneuvers essential to contemporary band performances. The ultra-lightweight, aluminum tubular body provides low mass of structure on the player while yielding unparalleled strength. The tubular structure has also been designed to fit a wide range of players, as well as is incredibly gender friendly, ensuring minimal to no pressure is placed on a female's chest. 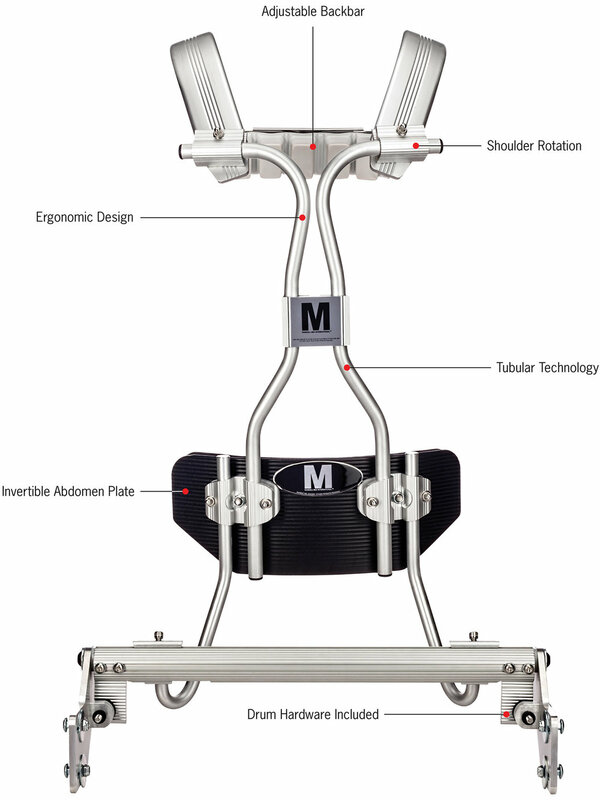 In conjunction with tubular technology, extended torso and full shoulder rotation adjustments, the Aluminum Tubular carrier allows for an ergonomic fit without sacrificing strength and durability. The newly tapered designed, black powder coated, aluminum abdomen plate can be inverted, reversing its shape for a better fit depending on the preference or body type of the player. Shoulder positioning can be fine tuned by rotating the shoulder’s caster down (into the back) and/or pivoting the camber angle (toward/away from the neck). The adjustable, lineal back bar facilitates additional shoulder adjustment and back bar support, with removable, Comfort Core Cushions. Other features include a torso height adjustment and a wide range of shoulder adjustments to maximize weight distribution. Innovative mounting hardware secures precise adjustments from carrier to drum eliminating slippage and unwanted rotation without excess tube stress. Comfort Core Cushions come standard on the adjustable back bar using a combination of two foams in isolated cubes for comfortable and conforming support. They are also available separately and can be retrofitted to the shoulders of any MAY carrier. Designed with slidable/adjustable J rod receivers, the lift front tenor rail is fabricated out of ribbed tubular aluminum allowing the tenor drums to be adjusted to the performers desired position. All Aluminum Tubular Snare carriers include respective drum mounting hardware. Designed to work in conjunction with the drums existing lug casings, the Free Floating Lug Bridge can be installed without drilling into the drum’s shell thus significantly reducing the weight of the connecting hardware. The FFLB also relieves stress on the multi-tom shell, all while connecting the drums at their preferred sonic region and playing position.